LOCATION This spacious property is set in a highly convenient position, only a short walk from Littlehaven station. The property is also well located within a short walk of a number of convenience stores, with the picturesque countryside of Rusper either a short drive or cycle ride further north. The property further benefits from being set just off local bus routes and is only a short drive from the A264 that connects to major road networks, including the A23/M23 and in turn Gatwick Airport. The historic market town of Horsham is only a mile away and provides a comprehensive range of shops, The Capitol theatre, Everyman Cinema, numerous sports and recreational facilities and a mainline train service to both London Bridge & Victoria in under an hour. PROPERTY The front door opens in to a Hall, which has two cupboards and an opening taking you through to the Living/Dining Room, which is a fantastic space measuring 18’5 x 12’0. 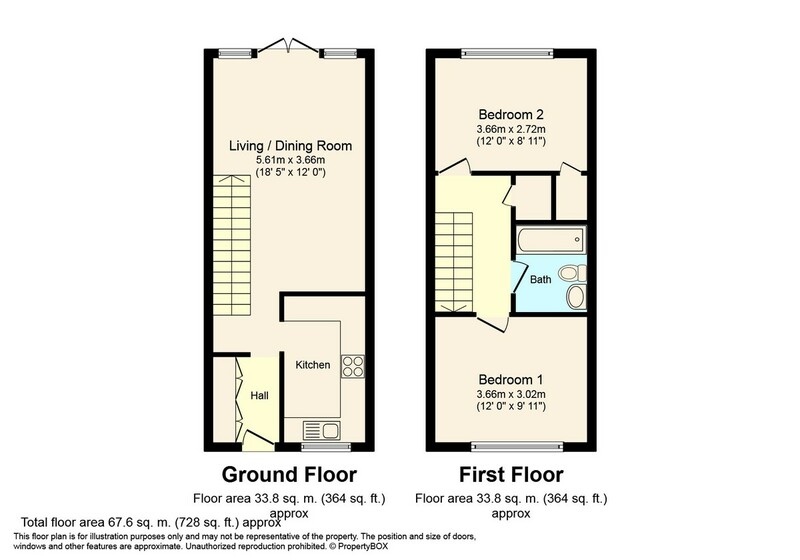 There is plenty of space for sofas and a dining table, double doors spilling out to the low maintenance Rear Garden, and an opening to the Kitchen, which has space for a selection of appliances. To the first floor is a Family Bathroom with a white suite and two generous double Bedrooms. OUTSIDE To the front of the property is a path, which is edged by lawn, that takes you to the front door. The Rear Garden is low maintenance, and is mainly laid to patio, perfect for barbecues in the summer months. At the bottom of the garden is a gate which takes you through to the block of garages, where you will find one for this property.